New design with the 8086 16-bit microprocessor. Best for learning the x86 instructions and hardware. 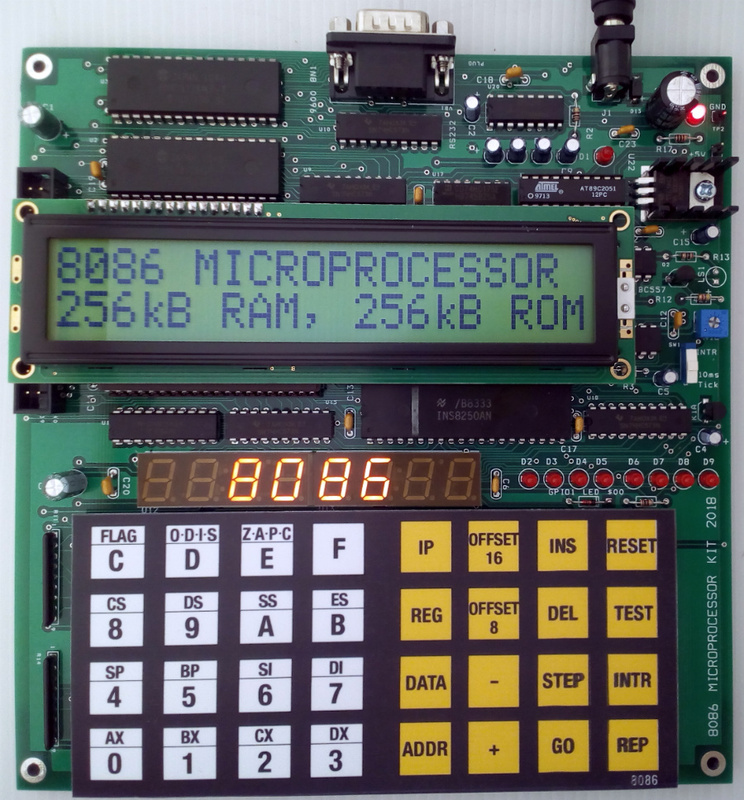 The 8086 microprocessor kit is another kit suggested by Francesco from Italy. The kit uses 8086, real 16-bit microprocessor. This kit has 16-bit EPROM for the monitor program, two 628128 SRAM for application program, 8250 UART chip for serial port. The platform is similar to all of my designs with 10ms tick generator for timer interrupt testing. I used GAL22V10, 24-pin PLD for memory and I/O decoders. Some hardware was similar to 8088 kit. With the 16-bit data bus, all I/O devices are located in EVEN addresses. The size is a bit bigger than 8-bit kits. 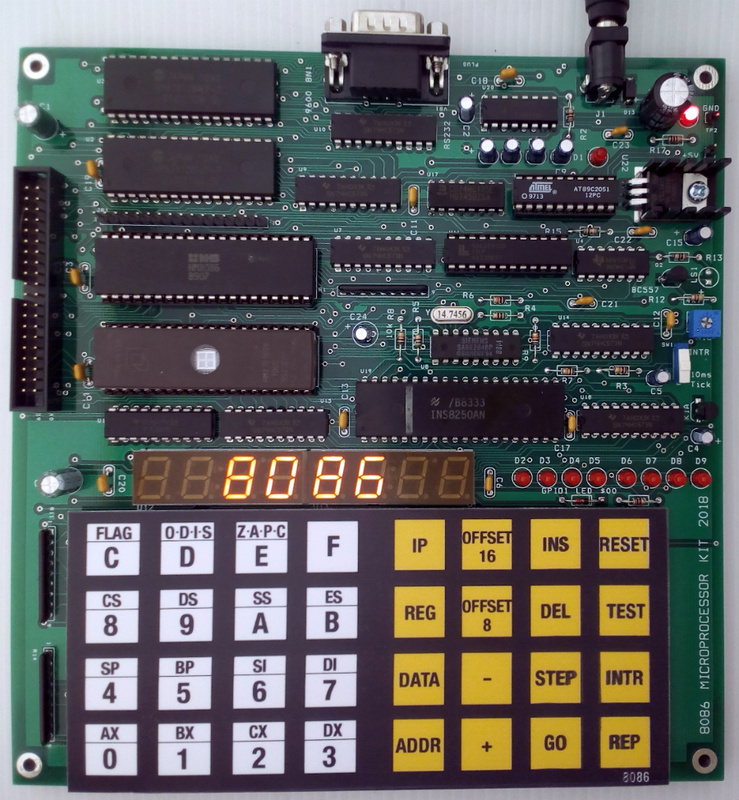 The 8086 kit is suitable for learning the low level CPU operations of the popular x86 based microcomputer. Kit is available in both DIY and prebuilt, ready for testing. The kit draws much power compare to the 8-bit. I decided to put the 7805 on board the same as 8-bit kit. This kit will need heatsink on the 7805. The 8250 UART, provides 9600 bit/s for Intel hex file downloading and serial monitor commands. Hardware descriptions: The 8086 CPU, U6 is minimum mode configuration. U7,U9,U10 74HC573 8-bit latch, demultiplexs 20-bit address bus. The CPU clock is generated by U8, 8284 chip. The Xtal frequency is 14.7456MHz. CPU clock is 14.7456MHz/3 = 4.9152MHz. PCLK is 2.4576MHz for UART chip. U1 is 16-bit 128kword EPROM, 27C1024. The address space for EPROM is decoded at 0xC0000-0xFFFFF. U2 is 128kB static RAM, 628128 for LOW BYTE and U3 is for HIGH BYTE. The RAM space is located at 0x00000-0x3FFFF. With the 16-bit bus, A0 is not used for addressing. CPU will access 16-bit locations using even address only. U11, memory and I/O spaces decoder chip is made with GAL22V10. It provides chip selected signals for memory and I/O chips. U5, the 20-pin 89C2051 microcontroller chip produces 10ms tick. SW1 selects between 10ms tick or manual INTR button. The chip uses PCLK, 2.4576MHz from 8284 chip. U15, 74HC541 is 8-bit input port (PORT0). PA7 is one bit for serial data RXD signal. U13, 74HC573 is 8-bit output port (PORT2). The 8-bit output drives the 7-segment LED directly. No current limit resistor. U14 (PORT1) drives 6-digit common cathode pin. The brightness is controlled by PWM. U16, 74HC175 is 4-bit output port (PORT3). Bit 3 is for TxD serial data stream. Bit 4 is for BEEP driver. U17, 74HC573 is 8-bit output port for 8-bit binary number display. D15 lifts the forward biasing for proper brightness. JR1 is 16-pin socket for text LCD interface. U18, MAX232 converts TTL level to RS232 level. Q1, KIA7042 is reset chip for power brownout. PLD equations : U11 is a PLD chip used to select the memory and I/O ports. The address and I/O spaces can be programmed using PLD equations. The source file of PLD equations is shown in Figure 4. The PLD compiler is ATMELWinCupl. The output file, JEDEC will be used to program the PLD chip by a PLD programmer. PLD equations for 8086 kit. 10ms System Tick: U16, 8051 compatible microcontroller is used to generate 10ms tick. The circuit runs with TTL clock from 8284 chip. The frequency is 2.4576MHz. The tick signal is output at P3.7. TP1 is 50% duty cycle with frequency of tick/2. D1 is for indicating tick signal. The source code was written in assembly code. The sample below produces a fixed frequency 100Hz or 10ms tick. Source code listing of 10ms tick generator. -Intel hex file downloading using 9600 bit/s RS232 port. The kit is connected to terminal by hitting key ENTER the terminal automatically. Serial port format is 9600 bit/s 8n1. To download Intel hex file, type key "L". 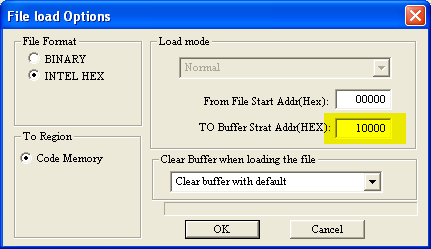 Then open Send the selected hex file. 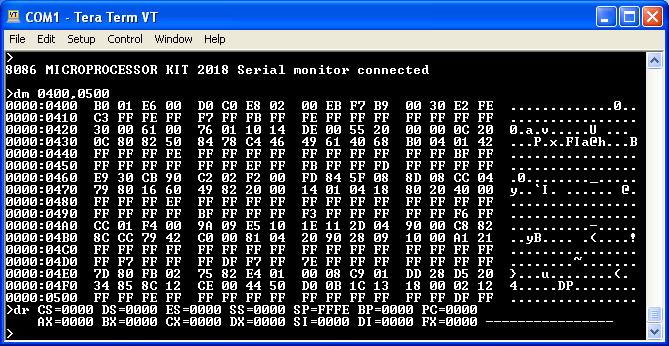 Monitor program was developed with Micro-C for 8086. The memory model was special ROM model. All initialized data are copied from ROM to RAM. Start location is $A000 with CS = $F000. Physical location is $FC000. Monitor source code is available for learning and customizing. User can modify the source code and reprogram the EPROM. The monitor EPROM is 16-bit version, 40 pins ceramic DIP. I used MiniproTL866CS programmer. The hex file is 8-bit version but for 16-bit EPROM, we must relocate it to location 10000. With Big letter LCD, 20x2 lines. Sample code for testing interrupt with simple vector byte FF on the data bus using 8-bit pull up resistor. Select SW1 to 10ms tick position. Download Hardware schematic, Quick Start , PLD files, monitor source code and hex file. Program examples for 8086 kit, ASM files, User's manual.